» All about student projects and USGIN collaboration with students and professors. 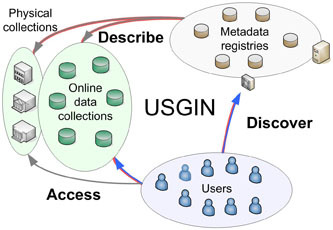 » First public draft release of the USGIN ISO 19139 (only ISO 19115) profile document for spatial dataset and dataset series metadata. » Here is a collection of web apps and documents we have created to help us organize and document USGIN related development. Contact us if you are interested but don't have the right access permissions. » OGC Web Feature Service (WFS) to serve GeologicUnit features. A GeologicUnit feature contains a description of the unit, and may include shapes for one or more outcrops of the unit.